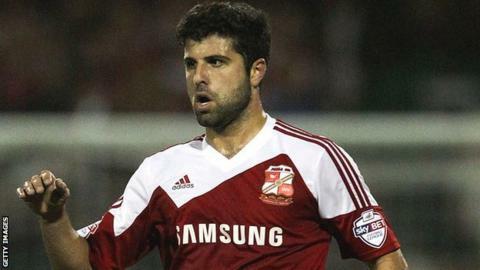 Swindon manager Mark Cooper is hoping Yaser Kasim receives an international call-up for Iraq so that Town's game with Chesterfield is postponed. Robins duo Massimo Luongo and Brad Smith have already been named in the 20-man Australia squad for games with Belgium and Saudi Arabia in September. Town can appeal for a postponement of their game on 6 September if a third player is called up. "We're praying Iraq call Yaser up so we can get the game off," said Cooper. He told BBC Wiltshire: "We're losing two big players out of our team but you need three for it to be rearranged. "It's a little bit unfair that we're going to have to go into our game without two of our key players, but we knew that when we signed them." Midfielder Luongo was part of the Socceroos squad at the World Cup in Brazil and has one full cap, while Sydney-born Smith, on loan at Swindon from Liverpool, has yet to play for his country. Australia face Belgium in Liege on 4 September before travelling to Fulham's Craven Cottage to play Saudi Arabia four days later. Baghdad-born midfielder Kasim has made one appearance for Iraq, who have a friendly against Peru in Dubai on 5 September. Swindon's League One rivals MK Dons have already had their game with Sheffield United on 6 September postponed because of their international call-ups.